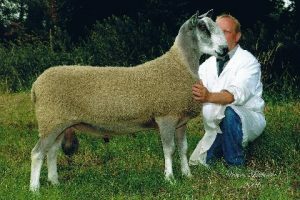 After a few of us saw (and drooled over) a photo of a ram named “Scotty” all the way back during New York State Sheep & Wool Festival 2007… straws from UK Bluefaced Leicester ram Mossvale Masterplan 1463/X6 E+ have finally been imported this year by Martin Dally of Super Sire, Ltd.! A few years ago there was a rumor that circulated briefly here, that on the way to the collection station, Masterplan had an accident getting out of a truck and broke a front leg. From whence it came, we have no idea, but many of us who were looking forward to the import were upset, thinking that this magnificent ram had to be destroyed. We’re so pleased to have this UK ram’s genetics available to us here in North America. He joins a great list of other UK rams whose straws entered the country this year. Please contact Super Sire, Ltd. at www.toprams.com for more information. 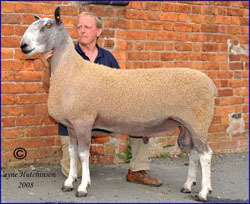 Here is a photo of one of Masterplan’s sons from the UK, bred by Phil May, Derwenlas flock. BFL champion longwool white ewe at Lambtown USA! Is Z2 the “Velvet Prince” ? I don’t know if it is. You could check with Jared; he might know.